Every two months for 23 years, Robert Lee Camp published a newsletter with special articles about the Cards, Astrology and other spiritual subjects, but mostly about the cards and 95% of the articles are written by Robert himself. Later these were published into books, each containing approximately two years of articles. You can view the table of contents of all of them and select the ones that you are most interested, or just purchase them all at a great discount by getting the Master Volume at the bottom of this page. Each book is presented in PDF format. Once you purchase it, you will be sent an email with a download location. These PDF have links that take you directly from their table of contents to the articles themselves while reading them. This is a collection of 15 articles by Robert, some of his earliest writings on The Science of the Cards and the spiritual path. Includes The Mystery of the 8 of Clubs Woman, Astrological Indications of our Times, Planetary Aspects, The Hidden Messages in Your Chart, The H.I.V. Blessing and many others. Instant delivery and no shipping! These two books are a collection of the articles that Robert wrote in The Voice of the Seven Thunders newsletter from October, 1992 through July, 1996. they also contain 25 additional articles that have not been published anywhere else. Volume II is the earlier collection while Volume III was just completed. This is the place to find many important articles about aspects of the Book of Destiny system that have not been formally published anywhere else. Both of these collections offer many articles on the advanced subjects that Robert teaching in workshops and techniques that are being used in the software programs. A must have for those who are learning the Science of the Cards. There are also articles about other related subjects, as found in the newsletter. Instant delivery and no shipping! The Voice of the Seven Thunders newsletter articles from July, 1996 till November, 1998, fifty five in all. These articles are from the time period when the new editions of Love Cards and Destiny Cards were released and so contain much new material. Instant delivery and no shipping! For new students, the Visions volumes are collections of articles by Robert Lee Camp. Most are about the science of the cards but there are also commentaries, articles on spirituality and some astrology too. 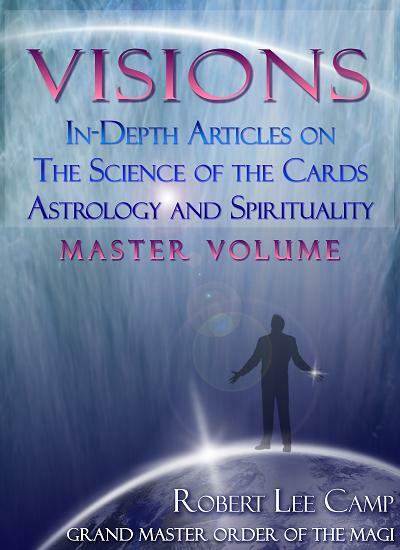 Visions Volume V has 54 articles in total from January 1999 – January 2001. Instant delivery and no shipping! For new students, the Visions volumes are collections of articles by Robert Lee Camp. Most are about the science of the cards but there are also commentaries, articles on spirituality and some astrology too. It has 56 articles in total and all the newsletter articles from March of 2001 through May of 2003. Instant delivery and no shipping! For new students, the Visions volumes are collections of articles by Robert Lee Camp. Most are about the science of the cards but there are also commentaries, articles on spirituality and some astrology too. It has 56 articles in total and covers the July 2003 to July 2005 period. Instant delivery and no shipping! For new students, the Visions volumes are collections of articles by Robert Lee Camp. Most are about the science of the cards but there are also commentaries, articles on spirituality and some astrology too. Visions Volume VII has 56 articles in total and covers the September 2005 to July 2007 period. Instant delivery and no shipping! This is our latest volume of Visions, 56 articles from two years of the newsletter starting in September 2007. 80 pages in PDF EBook form. Instant delivery and no shipping! Now, for the first time, you can get all the Visions volumes (nine total) in one beautiful and insightful EBook. This is the complete edition of all of Robert’s articles spanning nearly 20 years. These nine volumes normally cost $140 if purchased individually. Over 1,000 pages. Instant delivery and no shipping!